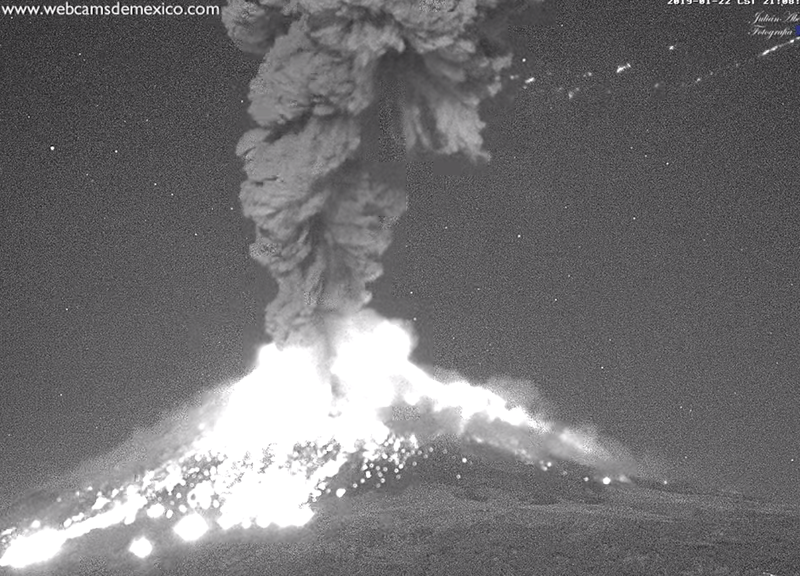 The Popocatepetl volcano sent a two-kilometre ash plume in an eruption last night, triggering an ash fall alert for communities in the vicinity. The 9:06 pm eruption was accompanied by the emission of incandescent material that fell a few meters from the crater on the eastern slope of the volcano and the two-kilometre-high plume of ash, water vapour and gases. The explosion was heard in nearby towns and caused windows and doors to vibrate as far away as Puebla city, located 44 kilometres to the east of the volcano. Authorities have issued recommendations following the low-scale eruption, including limiting open-air activities, bringing pets indoors and avoiding eating meals outside. Anyone who goes outside is advised to wear a face mask, a long-sleeved garment, and a hat. Once back indoors, people should rinse their eyes and throats with water. Special attention should be given to water tanks and other water sources for human and animal use, keeping them covered and protected from the volcanic ash. Hiking near the crater is not advised, as the emission of incandescent material and other ballistic fragments is expected to continue. The alert for Popocatepetl remains at yellow, Phase 2, which means that the release of water vapour and gas plumes is to be expected, as is the light fall of ash in nearby areas along with incandescent fragments. The alert level also warns of the possibility of eruptions causing pyroclastic flows and mudslides carrying debris, although at such a small scale that evacuation of inhabited areas is not required.